If you still spend your bathroom time having a shave and quickly washing your face, you need to change things up. We’re not living in the 90’s anymore; grooming is seen as being important for both men and women. By treating yourself to some grooming products, you can keep your skin healthy, your facial hair well preened and the wrinkles at bay. Oh yes, cleanser is for men as well as women, and it’s pretty essential. If you want healthy, happy skin that’s free of acne and blemishes, cleansing each day is crucial. Along with sweat and the effects of the weather, toxins from pollution can wreak havoc on your skin. That’s why, it’s so important that each morning and evening you cleanse your face. For skin that’s as healthy as possible, using natural products is always a good option, such as Liz Earle’s Men’s Cleanse. Products containing chemicals may cause your skin to flare up, resulting in redness and breakouts. Sore skin also makes shaving impossible, so when it comes to choosing a cleanser, natural is best. Don’t have a pot of moisturizer at home – invest in one today. It’s impossible for your skin to be healthy if it isn’t well hydrated, that’s why daily moisturization is so important. To prevent your skin becoming damaged and prone to wrinkling because of the sun’s UV rays, invest in a cream that has an SPF factor. There are lots of creams for men on the market, but one of the best is Clinique’s For Men SPF 21 Moisturizer. Whatever product you choose, ensure it contains sun protection. You might have the odd Chap Stick laying around the house, but while that’s a good start, it’s not enough. Did you know that just like the rest of our body, our lips can get sunburn? If you’re a runner, cyclist or skier, chapped lips are probably a common complaint. However, with the right lip balm, you can put a stop to them. When grooming your facial hair, a good-quality shaver is a must. Whether you prefer a wet or dry shave, it doesn’t matter, just as long as you have a high-quality razor to use. Cheap razors not only give a worse cut but can also damage the hair follicles and surrounding skin. For a good-quality shaver, check out the reviews at iwantashaver.com. Here, you’ll find lots of fantastic shaver designs to choose from. 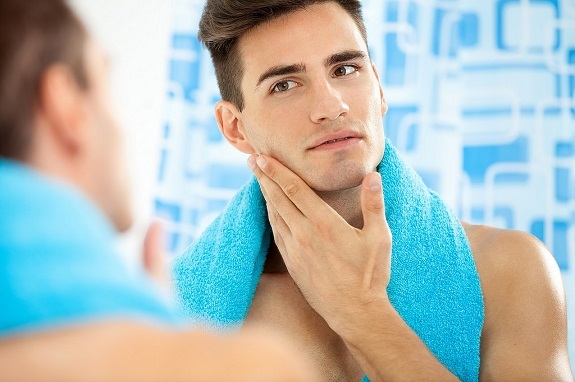 If you opt for a manual shaver, it’s also important to invest in some moisturizing shaving cream, to protect your skin. Whether you choose to shave with a manual shaver or an electronic one, for afterwards, shaving balm is a must. This will help to soothe the skin and moisturize, preventing wrinkles and redness. For after shaving, L’Occitane’s Cade Aftershave Balm is a great option. So there you have it, all the essential grooming products us men need.